The video below explains that an external camera detects faces and motion of passersby, and an internal accelerometer detects head movement. 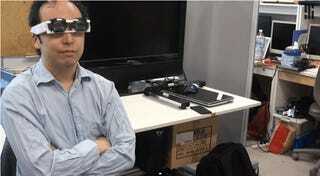 The software then attempts to generate appropriate-looking eyes for the situation—even if the wearer's actual eyes are closed. Via Spectrum and The Verge.